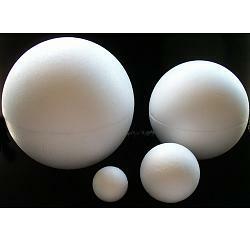 DENSE POLYSTYRENE SPHERES FORMS IN: 2.5", 4", 8", 10" AND 12" SIZES. THE THREE LARGEST SIZES COME IN HALVES FOR EASY SHIPPING. THE HALVES HAVE AN INTERLOCKING SYSTEM PROVIDING AN ALMOST SEAMLESS SPHERE. WE ARE EXCITED TO BRING YOU THESE WONDERFUL AND UNIQUE POLYSTYRENE FORMS TO MOSAIC. THE SMALLER SIZES WOULD MAKE WONDERFUL DECORATIVE BALLS AND FINIALS WHILE THE LARGER SIZES ARE PERFECT FOR GARDEN GAZING BALLS. LET YOUR IMAGINATION RUN WILD!